◊◊ Jupiter Mass - a unit of mass equal to one Jupiter (1.8986 x 1027 kg, 317.83 Earth mass; 1 Earth mass equals 0.00315 Jupiter masses). Jupiter mass is used to describe masses of the gas giants, such as the outer planets and extrasolar planets. The symbol for Jupiter mass is MJ. ◊◊ Degeneracy Pressure - the pressure created in a dense gas by the interaction of its electrons; degeneracy pressure does not depend on temperature and thus, pressure doesn't decrease as a star cools. ◊◊ T Dwarf Class also known as a methane brown dwarf, these are amonst the coldest stars known (temperatures lower than 1473-degrees k. or 2192-degrees f.), their spectra exhibiting methane absorption bands. Also see M dwarfs, L dwarfs and T dwarfs Page at the Space Telescope Science Institute. Image: ESA/NASA/HUBBLE/MACHO team. Based upon our definition of what comprises a star, Brown Dwarfs don't quite make the grade; they never achieve the high core temperature required to begin the nuclear process of hydrogen burning and as a result, they produce little of the light and heat of normal stars (though differences between the highest mass Brown Dwarfs and the lowest mass stars are subtle). This has also made the Brown Dwarf an extremely difficult star to locate, their discovery coming only after a twenty-year long oddessy which saw more than it's fair share of ups and downs while employing various survey methods and technologies. BLACK DWARF? BROWN DWARF? RED DWARF? "it was obvious that we needed a color to describe these dwarfs that was between red and black. I proposed brown and Joe (Silk) objected that brown was not a color." So, brown really isn't a color? Well, for the painter, the artist or even you and I, brown is certainly a color but for the astronomer, brown isn't one of the colors (or wavelengths) on the spectral chart - ROY G BIV. In other words, these stars do not emit photons of brown light. But no matter, the name stuck and is descriptive enough for this star considering it's dark, cool character. The Not-Really-Brown-But-Orange-Reddish-Very Cool-Infrared-Convection Dwarf Star? At least a star is a star -- Right? "Brown Dwarfs are the ill-defined middle ground between planets and stars. A star is a star because it shines on its own, generating light through thermonuclear reactions in which hydrogen is converted to helium. Brown Dwarfs, though they can burn deuterium in another type of reaction called "core fusion," fall short of full-blown stellar thermonuclear fusion." As for the physics, it's a simple matter of mass: Brown Dwarf stars simply do not have the mass to begin the stable fusion of hydrogen, a requirement in order to be considered a true "star", and are thought to exist at mass levels below the required minimum to do so - 75 jupiters (while the lower limit seems to be 13 jupiters). While Brown Dwarfs do have enough mass to burn deuterium, the mechcanism that keeps these types of stars from simply collasping is another source of pressure - the degeneracy pressure on electrons - which accounts for the star's ability to remain stable and above gas giant status, like Saturn and Jupiter, in the absence of thermonuclear fusion (though Brown Dwarfs are never totally degenerate). See the article Brown Dwarfs at The Astrophysics Spectator for an overview regarding the physics of Brown Dwarfs and the Home page of this same site for an explanation of Degeneracy Pressure. Also see the excellent Brown Dwarfs within 10 parsecs at the Sol Station website. "will be able to see 450-K Brown Dwarfs out to a distance of 75 light-years (ly), 300-K Brown Dwarfs out to 20 ly, and 150-K Brown Dwarfs out to 10 ly." WISE mission website. "A brown dwarf is less massive than a star, so there is less gravity available to pull it together. As a result, astronomers debated whether a brown dwarf could form the same way as a star." Much of the discussion regarding the star status of Brown Dwarfs centers around their evolution - the current "gray areas" that ongoing scientific research is looking to fill. 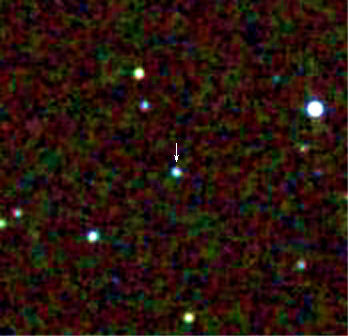 The handful of dicovered Brown Dwarfs coupled with recent survey results have only increased the questions regarding their populations within the universe and while newly accquired data images show promise regarding the process of their formation, Brown Dwarfs are continuingly showing themselves to be as elusive and troublesome as they were in the years prior to their discovery. ◊◊ Stellar Stillbirths: Brown Dwarfs Revealed As Third Class Of Celestial Bodies After Stars And Planets Bonn, Universitaet (2008, August 22). Stellar Stillbirths: Brown Dwarfs Revealed As Third Class Of Celestial Bodies After Stars And Planets. ◊◊ A resolved outflow of matter from a brown dwarf From the Nature publication, Volume 435, Issue 7042, pp. 652-654 (2005, Authors - Whelan, Emma T.; Ray, Thomas P.; Bacciotti, Francesca; Natta, Antonella; Testi, Leonardo; Randich, Sofia). 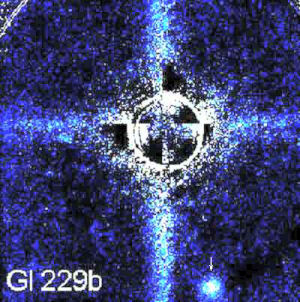 Here's another image of the brown dwarf Gliese 229B from the APOD website. 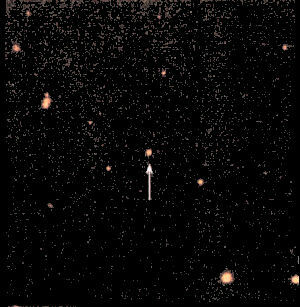 In order to "see" the small brown dwarf over the illumination of the larger star (Gliese 229) special filtering teqniques had to be employed. 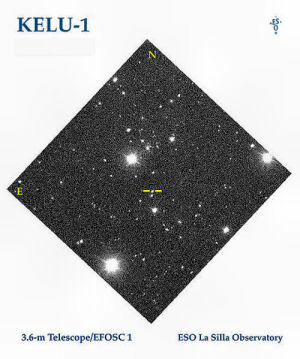 Teide 1 (arrow) was the first brown dwarf to be verified in 1995 and is located in the Pleiades open star cluster approximately 400 light years from Earth. It is a relatively young brown dwarf (about 100 million years old) with a mass as great as 55 Jupiters and an atmospheric temperature approaching that of a red dwarf. One of the reasons that Brown Dwarfs had been so elusive is due to the fact that even at their brightest they require extra special planning strategies and equipment to find. This particular brown dwarf was discovered in a search of distant star clusters using a charge-coupled device (CCD). ...of more recent investigations into Brown Dwarfs is "NASA's flagship mission for X-ray astronomy", the obiting Chandra X-ray Observatory. 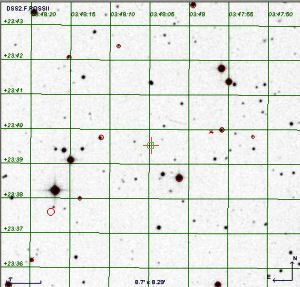 Another survey that has located brown dwarf stars is the Two Micron All Sky Survey (2MASS). 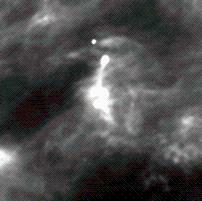 Above is a false-color image showing a methane brown dwarf (arrow), also called a "T dwarf". This type of image is generated by mapping the three near-infrared wavelengths, at which 2MASS observes, into blue, green, and red colors. On the internet thrives a plethora of amateur and professional astronomical web sites containing pages of theorectical discussions, theories, images, concepts and educational material from both the home user and the centers of scientific research. But perhaps the most intersting is the growing branch of grphical art or graphic based composite images of our stellar universe. Most of these images are based on solid scientific concepts, ideas or theoretical models. Many of the artists themselves are accredited science majors in one field or another and use their education and knowledge as the basis for what they create. One is able to view their work amongst most of today's leading scientific pages found across all major science based publications and web sites around the world: NASA/JPL, APOD, ESO, Harvard, Cornell, ESA, Astronomy | Sky & Telscopes Magazines and this web site. 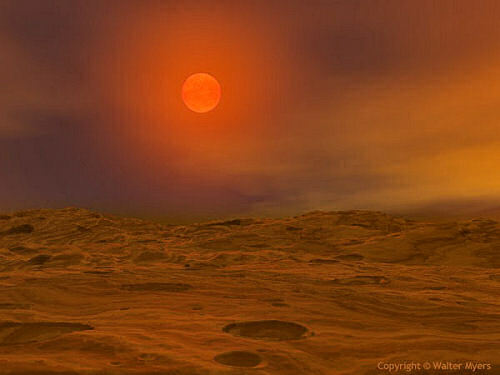 "This is how Teide 1 might appear from the surface of a hypothetical, mars-like planet"
His works are "possibilities of the physical world, especially landscapes: terrestrial and those beyond the Earth" and that is certainly true of this image. For more information on this and other images by this artist please visit his site by Clicking Here Image Copyright © - used with the kind permission of Walter Myers. "Cha 110913-773444 (sometimes abbreviated Cha 110913) is an astronomical object surrounded by what appears to be a protoplanetary disk. There is no consensus yet among astronomers whether to classify the object as a Sub-brown dwarf (with planets) or a rogue planet (with moons). It is even smaller than OTS 44 which had been the smallest known brown dwarf prior to the discovery of Cha 110913-773444." 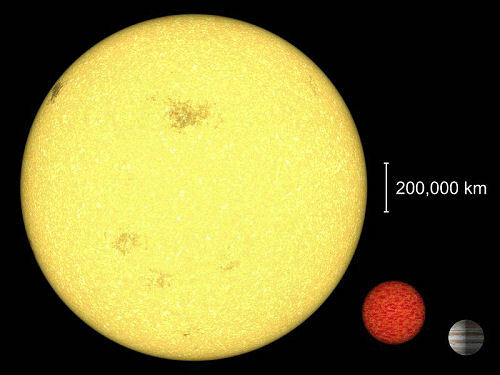 In conclusion, one must wonder, when looking at the relative size of stellar objects, just who the "dwarf" really is. Well, in the classification of things, size sometimes isn't the necessary criteria to the life within our universe, just a part of the evolutionary process that brings it to life. With additional survey planning in the works, scientific exploration within the field of Brown Dwarfs should prove very interesting over the next 5-10 years. Especially now, as it seems that this area is very closely associated with extrasolar planet exploration and research. Brown Dwarf Detectives Article at the NASA website regarding UCLA astronomy professor Ian S. McLean and colleagues: using the Keck II Telescope at the W.M. Keck Observatory in Hawaii to hunt Brown Dwarfs. A short one page article based on Wikipedia information on Brown Dwarfs. This page gives a very nice and concise overview of these objects and is arranged by "History", "Theory" and "In Practice" along with relevant sub-sections. By San Francisco State Astronomy Professor Lynda Williams An article Published in the "Golden Gator" (San Francisco State University) regarding the search and discovery of Brown Dwarf PPL 15. 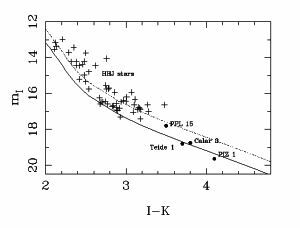 "Kelu-1 is a binary L dwarf: first brown dwarf science from laser guide star adaptive optics." "Ammonia as a tracer of chemical equilibrium in the T7.5 dwarf Gliese 570D." Stellar Art site that has some very excellent work displayed. Click on images below. From Cool Cosmos, "Brown Dwarfs are objects which are too large to be called planets and too small to be stars." Click the image to visit this very well done web site.